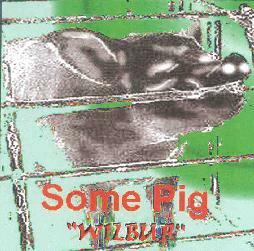 Some Pig - "Templeton" / "Wilbur"
Some Pig is a collaboration between creative avant-improv guitar masters Bret Hart and Ernesto Diaz-Infante. Though recorded in the same year, Templeton and Wilbur are each very different from one another. While there's plenty of guitar on Templeton to satisfy fans of Bret's and Ernesto's guitar works, the project is also heavy on electronics, vocals, and voice samples, some of the vocals implying that the duo set out to make a freaked out avant-garde folk album. The space factor is high on this set, though there's nothing meditative about it. Sometimes it sounds like a cosmic avant-garde chamber ensemble. At others I felt like I was listening to some liquid lysergic Rugrats soundtrack. At any rate, the duo kick the freaky meter into high gear from start to finish as they crank out six tunes assembled in a sonic collage style. We hear avant-improv guitar strums and attacks, quirky frenetic electronic percussion, freaky space electronics, and vocals that seem to crossover between folk and psychedelic. Plenty of creative mangling on acoustic guitar and strained atmospherics on the electric. I dig the electronic and guitar space mayhem, and I'm sure much of the electronics are actually guitar. I love the lone alien on "Oink 2" (the tracks on both CD's are all titled "Oink 1", "Oink 2", etc) who transmits a personal heartfelt song to anyone who might receive his signal. "Oink 3" is interesting as it includes some proggy symphonic bits in the background. "Oink 5" is the most purely guitar oriented track, being something of an acid-noise-psych sonic meltdown, but with an oddball Residents-like edge to it and a touch of twisted Blues. And "Oink 6" has some excellent Sun Ra styled freakout keyboards. LOTS happening here... WILD stuff! Wilbur consists of 18, mostly short tracks. And while the duo incorporate little, if any, of the electronics so integral to Templeton, the variety of sounds is no less impressive. These guys can wrench more sounds from their guitars than most electronic artists can produce with their high tech synths, and are no less mindfucked and freaky. The set opens with a bang with a guitar (and violin?) assault on which bowed, scratched and scraped strings duel to the death. 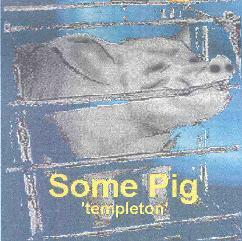 Strange vocals and sounds recall both the folk and psychedelic elements heard on Templeton. "Oink 19" is a standout with drugged folky vocals, Derek Bailey style guitar, and Mr Roger's Neighborhood piano. Wow! "Oink 21" features impressive guitar work and sounds like a pairing between Fred Frith and John Fahey. "Oink 22-23" keeps the excellence rolling as the pair combine contrasting guitar sounds that complement each other beautifully (do I hear violin again?). MUST listening for avant-improv guitar fans. For more information you can visit the InstrumenTales Records web site at: http://hartsongs.tripod.com/bret_hart_page1.htm. Contact via snail mail c/o InstrumenTales Records; 609 Morehead Street; Eden, North Carolina 27288.